It's the red thing in the image above - a wiring product that installs in your guitar quickly - with no batteries, no modifications to the guitar, and typically no soldering. It replaces the stock electronic circuit, and is built with the same industry-standard brands of pots, switches, and jacks that premium American guitar companies have been using for years. We have them to fit many popular guitars. 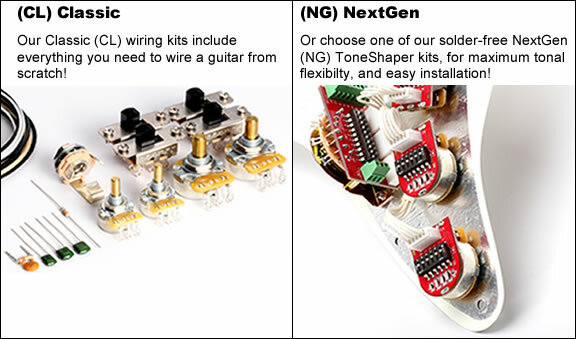 So, do ToneShaper products make the installation of your guitar's electronics easier? Yes, absolutely. But they also offer a revolutionary amount of flexibility in the circuit, making it easy to adjust or fine-tune the function of the controls, in order to suit your tastes and needs. Click on the links below for details about specific models. 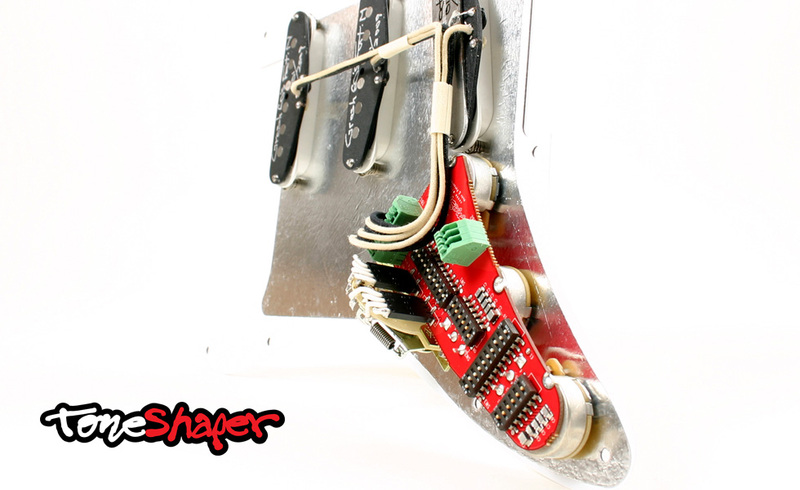 ToneShaper replaces your Strat's stock wiring, quickly and easily, without soldering. It provides increased flexibility that you cannot get with any other product. Cool switching options. Customizable tone controls. Built-in solutions for dealing with treble loss that happens when you turn down your volume control. Simple installation, simple operation, top-quality components. Most users will select 250k pots for use with single-coils, but some people will prefer 500k pots (which will give the guitar an overall brighter, thinner tone). 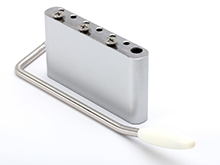 Some manufacturers may recommend 500k pots for use with certain of their pickups, such as single-coil-sized humbuckers. 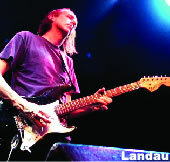 The short (1/4") bushing length is appropriate for pickguard-mounting, while the long (1/2") bushing length is appropriate for rear-routed guitars, where the bushing must be long enough to pass through the guitar's wood top and still allow you to install the flat washer and nut on the face of the guitar. The traditional bushing length on pots used for rear-rout installations is 3/8", but we've found that to be too short for many bodies, including rear-routed Strat and Tele bodies we've seen from the major aftermarket suppliers out there like Warmoth. So we ordered ours from CTS with 1/2" bushings, so you won't have any surprises. Understand that we're talking about the lengths of the bushings here, not their diameters. The bushing diameter on all of our CTS pots is 3/8", with a 3/8-32 thread. One problem you'll find with most CTS 500k pots out there is that they have the flat back design that is commonly used in Gibson guitars. These pots use CTS' high torque design, which means the pot is harder to turn. Their low torque design has the dimpled back, also known as a tip-bearing cover. This is what you're used to seeing in Strats and Teles, and this is what all of our Strat ToneShapers will come with, whether 250k or 500k, long or short. Using the onboard DIP switches to configure your ToneShaper, you can dial it in to fit your needs. Choose from four basic scenarios, each of which is customizable. Try them all, it's easy! This unit features top-quality components such as a USA-made, 4-layer circuit board. The two outer layers are ground planes that shield the internal circuitry from Electromagnetic Interference and Radio Frequency Interference (EMI/RFI). This is the state-of-the-art. We went top-drawer, because we knew you'd want it to be quiet. The pots are CTS audio-taper with split shafts, custom-made for this application. The switch used is the same CRL model Fender started with, back in 1954. The Switchcraft model 11 jack is the industry standard. We've used all the best brands, because we know tone is important to you. We know what the good stuff is. Mount the ToneShaper unit and switch to your standard Fender pickguard (fits our own Acme CNC pickguards perfectly too). Your pickup leads and assorted ground wires just plug right in - quickly and easily - with press-and-release terminals. There is NO SOLDERING required. These connectors are simple to use, don't degrade the signal quality, and hold the wire very securely. Enjoy swapping pickups in and out of your guitars? Then you're going to love the connectors on the ToneShaper! New Product Coming Soon! Should be here by May 1. 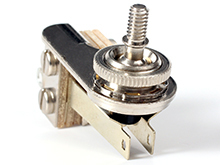 ToneShaper replaces your Tele's stock wiring, quickly and easily, without soldering. It provides increased flexibility that you cannot get with any other product. Cool switching options. Customizable tone control. Built-in solutions for dealing with treble loss that happens when you turn down your volume. Simple installation, simple operation, top-quality components. Next, select your control layout. The ToneShaper unit is available in two basic configurations: conventional controls and reversed controls (click for a picture). Conventional controls are what you're used to seeing on your Tele, while reversed controls put the volume control at the front, the tone in the middle, and the switch at the back. Some people prefer this, as it provides more immediate access to the volume control. Finally, choose your jack length. 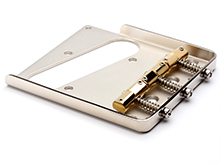 Both jacks are Switchcraft panel jacks, the exact same jacks used by Fender since 1950. The difference is in the length of the threaded bushing. The longer length will give you a few more threads, so if your Tele has a conventional jack ferrule then you'll be able to get the proper washers and the nut on there without a struggle. Using an Electrosocket? Then you'll want the short jack, which is the one the Electrosocket was designed to fit. All Tele ToneShapers have a selectable volume pot, so you can choose between 250k or 500k operation. 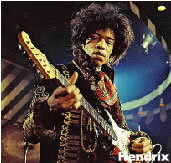 The value of the pot affects the overall tonality of the guitar, even when the volume is turned all the way up. 250k is the traditional value used in Teles, and will produce a slightly fuller and warmer tone. Switching the unit to 500k operation will make the guitar a little brighter overall, which might benefit some guitars that are already inherently warm. It's easy to switch between the two values, so you'll be able to try both, and quickly determine what works best in your application. 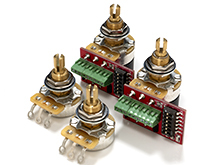 This unit features top-quality components such as USA-made, 4-layer circuit boards. The two outer layers are ground planes that shield the internal circuitry from Electromagnetic Interference and Radio Frequency Interference (EMI/RFI). This is the state-of-the-art. We went top-drawer, because we knew you'd want it to be quiet. The pots are CTS audio-taper with solid shafts, custom-made for this application. The switches used are Oak-Grigsby, just like Fender uses on their Custom Shop guitars. Two jacks are available: a Switchcraft model 11 that is the industry standard, or a Switchcraft L11, which has a slightly longer threaded bushing, so that you can get the proper washers on there and still have enough threads to get the nut on. We've thought of everything. And we've used all the best brands, because we know tone is important to you. Mount the ToneShaper and switch to your standard Fender control plate (fits Callaham and Gotoh plates too, as well as many other brands). Your pickup leads and assorted ground wires just plug right in - quickly and easily - with press-and-release terminals. There is NO SOLDERING required. These connectors are simple to use, don't degrade the signal quality, and hold the wire very securely. Enjoy swapping pickups in and out of your guitars? Then you're going to love the connectors on the ToneShaper! Order your unit to meet today's needs. Next month, if your needs change, just buy a new switch. No need to buy a whole new ToneShaper. This modular approach makes it easy for you change with the times. Or your whims. And unlike many manufacturers, we won't gouge on the parts pricing: piecing together ToneShaper products a la carte from our parts section costs nearly the same as buying our complete kits. ToneShaper replaces your Tele's stock wiring, quickly and easily, without soldering. It provides increased flexibility that you cannot get with any other product. Cool switching options. Customizable tone controls. Built-in solutions for dealing with treble loss that happens when you turn down. Simple installation, simple operation, top-quality components. You order the unit to fit your needs. First, decide which switch you want (the switch determines the unit's functionality). Plug in a 3-way switch and get conventional Tele switching. Plug in a 4-way, and get a bonus pickup combination (the 4-way option will not work with braided-lead humbuckers - please call if you have questions about this). The switch simply plugs into the main circuit board. Have a Tele with only one humbucker? Then check out our ToneShapers with 5-way switches, which are optimized for single-coil/humbucker combinations. All Tele ToneShapers have a selectable volume pot, so you can choose between 250k or 500k operation. 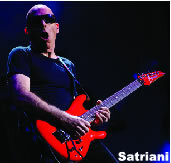 The value of the pot affects the overall tonality of the guitar, even when the volume is turned all the way up. 250k is the traditional value used in Teles, and will produce a slightly fuller and warmer tone. Switching the unit to 500k operation will make the guitar a little brighter overall, which will likely benefit those guitars that have two humbuckers. It's easy to switch between the two values, so you'll be able to try both, and quickly determine what works best in your application. Mount the ToneShaper and switch to your standard Fender control plate (fits Callaham and Gotoh plates too, as well as most other brands). Your pickup leads and assorted ground wires just plug right in - quickly and easily - with press-and-release terminals. There is NO SOLDERING required. These connectors are simple to use, don't degrade the signal quality, and hold the wire very securely. Enjoy swapping pickups in and out of your guitars? Then you're going to love the connectors on the ToneShaper! Order your unit to meet today's needs. Tomorrow, if your needs change, just buy a new switch. No need to buy a whole new ToneShaper. This modular approach makes it easy for you change with the times. Or your whims. And unlike many manufacturers, we won't gouge on the parts pricing: piecing together ToneShaper products a la carte from our parts section costs nearly the same as buying our complete kits. 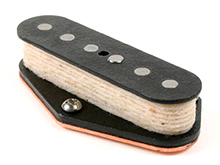 Most players who add a humbucker to the neck of their Tele use the stock 3-way switch. 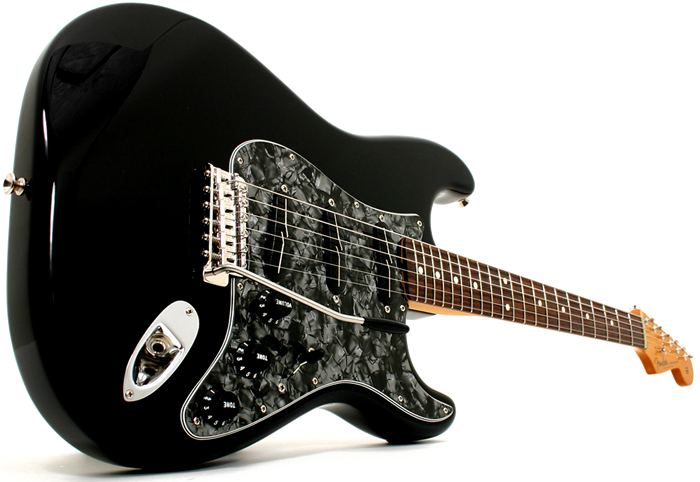 But we think most players would like to be able to split the humbucker, which allows for more tonal flexibility. Assuming your guitar has a 3-conductor or 4-conductor humbucker, then you can use the ToneShaper with a 5-way switch, which will allow you to split the humbucker. However, if you have a humbucker with a single-conductor braided lead, like the original Gibson pickups, you'll need to use the ToneShaper with a 3-way switch (you can also use this switch if you have a P-90 neck pickup). 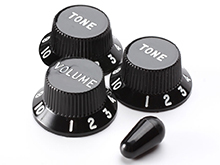 In either case, the ToneShaper's volume pot is designed specifically to give you the best tone from your pickups. Mixing humbuckers and single-coils always presents a dilemma: Do you use a 250k volume pot to accommodate the single-coils, or a 500k volume to accommodate the humbucker? The value of the pot has an effect on the tone, and most single-coils are voiced for 250k pots, while most humbuckers are voiced for 500k. With the ToneShaper, you don't have to compromise. When you order a Tele ToneShaper for hum/single combinations, we use a 500k volume pot to accommodate the humbucker, but we've incorporated a couple of resistors that are brought into the circuit in the other switch positions, lowering the load to 250k. So the full-humbucker setting (all the way forward) sounds like a humbucker should, and the single-coil and combination positions sound like they should. (Prefer sticking with 500k in all positions? No problem, ToneShaper can do this too). Note: This unit requires a 3-conductor or 4-conductor humbucker. 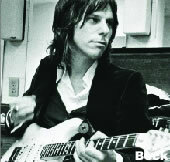 Most players who add a humbucker to the bridge of their Tele use the stock 3-way switch. But we think most players would like to be able to split the humbucker. The 5-way switch that we package with this unit will give you both humbucker and single-coil tones from your humbucker. We've also considered the volume pot's value. Mixing humbuckers and single-coils always presents a dilemma: Do you use a 250k volume pot to accommodate the single-coils, or a 500k volume to accommodate the humbucker? The value of the pot has an effect on the tone, and most single-coils are voiced for 250k pots, while most humbuckers are voiced for 500k. With the ToneShaper, you don't have to compromise. When you order a Tele ToneShaper for hum/single combinations, we use a 500k volume pot to accommodate the humbucker, but we've incorporated a couple of resistors that are brought into the circuit in the other switch positions, lowering the load to 250k. So the full-humbucker setting (position 1) sounds like a humbucker should, and the single-coil and combination positions sound like they should. (Prefer sticking with 500k in all positions? No problem, ToneShaper can do this too). The unit ships with everything you need to completely wire a Les Paul, except for the pickups. There are four pots, plus a Switchcraft toggle switch and Switchcraft jack. And a nice bag of assorted hardware (nuts, washers). Hey, we even give you a screwdriver for the bridge ground connection! Everything you need, so there won't be any nasty surprises. Who needs nasty surprises? We have two switches available, both from Switchcraft. The long switch is the one traditionally used in carved-top Les Pauls (Standard/Custom/Deluxe, et al. ), while the short one is used in some newer Gibsons, and will fit in thinner guitars where the length of the long switch might be problematic. The long switch comes with a deep nut, while the short switch, which doesn't need one by virtue of having a longer threaded bushing, does not. Click here for more information about Switchcraft switches, including dimensions. The tone pots you select will determine whether or not you can split your humbuckers (assuming you have humbuckers, and that they have 4-conductor leads). This is a cool option, and the ToneShaper makes it cooler than normal by allowing you to combine coils in parallel, rather than splitting the pickups (read more below). But all other functionality described below is built into the circuit board, so with the exception of the pickup splitting, you'll get all of the ToneShaper's functionality regardless of the tone pots you select. We call these volume kits. They consist of a 150k resistor and 1000pF capacitor wired in parallel across two lugs of each volume pot. For those who select modern wiring, these will prevent the treble roll-off that accompanies turning down your volume controls. You can try them and see if you like them. Some do, some don't. They are independent of each other, so you can easily enable them for either volume control or both, or bypass them altogether. Most Les Pauls have come from Gibson with 500k pots. But that's not written in stone; they have experimented with different values, and they've even experimented with linear pots (what were they thinking?). Well, we use audio-taper pots exclusively, and the ToneShaper comes with 500k, but we give you the opportunity to "change" them to 300k at the flick of a switch. Or actually, four switches. Because you can change any or all of them as you see fit. Why? No, it's not about utilizing value-added functionalities or aggregating collaborative infrastructures, it's about tone. 300k pots will make your guitar sound different than 500k. Better? Worse? Well, we're guessing some of you will end up liking 300k, and others 500k, so we'll let you decide. Ever notice that if you have your Les Paul's switch in the middle position, turning down either pickup shuts everything down? A Jazz Bass doesn't do that, and it has two pickups and two volume controls too. Was Leo Fender's team just cleverer than Ted McCarty's team? All joking aside, you can wire it either way, so we give you both. Like most things in life, there are pros and cons with each. You try, you decide. Order the unit with optional push/pull pots, and you can split your pickups (four-conductor pickups required). But we give you more control than that. Which coil would you like to have remain on? You decide. Some people like to have the screw coil remain on, other people prefer to have the slug coil remain on. 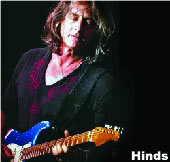 Have unbalanced humbuckers, such as Fralin Unbuckers or Gibson Burstbuckers? Then this is critical, as you'll almost surely want to have the stronger coils remain on when the pickups are split. And there's a third option: both coils on, but in parallel rather than series (series is the way they're usually wired). This last option gives you an open, airy tone that's reminiscent of a single-coil, but it's hum-canceling. So, more tonal goodness for you there, you betcha. Which capacitor values to use? (The capacitor values affect the operation of the tone controls) Is .015µF right? .022µF? Gibson used the latter, but these days players want to experiment. Well, experiment away, because you can select between seven different values for each pickup, ranging between .01µF and .047µF. Yes, that's for each pickup, so you can set them up independently. Optimized. We scratched our heads (and other regions). And we thought up something cool. Attach the whole ToneShaper shebang to one pot, and make the other pots floating. Control spacing becomes a non-issue, because the pot positions aren't fixed. You say you have an Epiphone, not sure if the spacing is the same as a Gibson? Or maybe you have a Gibson, but you don't know if Gibson has always been consistent with regard to control spacing? It's a non-issue. Floating architecture means the unit mounts to one control hole, and the position of the other three isn't critical. It'll fit. Like all of our ToneShaper products, we use the finest components. The switch and jack are Switchcraft, of course. And the pots come from CTS and Bourns. The volume pots are CTS, and we use a long-bushing (3/4" bushing length) for the neck volume control. We use a specially-made medium-bushing pot (1/2" bushing length) for the other three pots. The PC board is attached to the longer pot. 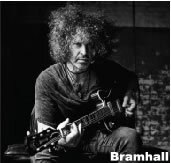 The 1/2" bushing length of the other pots was chosen for two reasons: First, it's long enough to get through any Les Paul top, with sufficient threads protruding from the face of the guitar to install the washer and nut (we provide extra lockwashers for use inside the guitar, so you can fine-tune the number of threads that protrude through the face of the guitar - wouldn't want those knobs sticking way up in the air, might give your Lester a complex). And second, the 1/2" bushing length allows the PC board - which is mounted to the longer 3/4" pot - to float above the shorter pots, allowing for flexibility of control spacing. 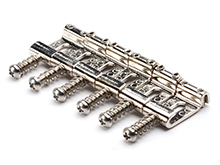 We also ordered Bourns push/pull pots to use as optional tone controls for players with four-conductor pickups. Bourns is huge in the potentiometer industry, but they don't have nearly the guitar-market share that CTS has. But they're gaining ground, and they're recognized as top-quality. Choosing them for the push/pulls was a no-brainer, but we optimized them in two important ways: The first is that we ordered them with 1/2" bushings, like the CTS pots we ordered. Just like the CTS pots, this will ensure that the bushing is long enough to allow mounting through the thickest Les Paul top. The second improvement - wait for it - is 24-tooth knurling! Yes, finally you'll be able to get quality push/pull pots for your Les Paul (and other guitars) that use the 24-tooth knurl pattern that's been used forever in the U.S. So your molded Gibson knobs will finally fit all four pots. Amazing. We have the unit available with the standard pots in all four positions, or the Bourns push/pull pots for the tone controls. New Product Coming Soon! We should have this in stock by May 1. Our pushbutton is a DPDT push/push switch, attached to your choice of a 250k or 500k audio-taper CTS pot, with either a solid or split (knurled) shaft. The pot mounts to your pickguard or control plate, and provides the platform for the DPDT switch, which is attached to the pot via a circuit board. The DPDT switch can perform many tasks, such as coil-tap, series/parallel, phase-switching, etc. Anything that a push/pull pot or mini-toggle DPDT switch will do, this will do. The pot can be used as either a volume or tone control. If you choose to use it as a volume control, you'll find a volume kit built in, which can be turned on or off to suit your preference. If you use it as a tone control, you'll find three capacitors built in, which can be individually selected - or combined - via the mini-DIP switches. This gives you seven different values to choose from, which allows you to dial in the tone control to your liking. The unit is solderless, so all nine terminals (six for the switch, and three for the pot) are accessed via a solderless terminal block. The centerline spacing between the switch and pot was determined by the Tele's control spacing, so that the switch lines up precisely in the middle of the two pots when the unit is attached to a Tele control plate, regardless of whether it's used as a volume or tone control. This also provides a convenient spacing when used on a Strat. Once the knobs are mounted, the switch is perfectly centered between the first two knobs and the switch. You will have to drill a hole in your pickguard or control plate for the switch to poke through, or buy one of the pre-drilled Callaham control plates available here. The unit is very low-profile, and there is some limited amount of height adjustment available to compensate for the thickness of various pickguards, by playing with the washers underneath the pot. Typically, the pushbutton is nearly flush with the mounting surface when in the down position, and sticks up just slightly when in the up position. Hence it is out of the way, yet very convenient and accessible. The unit ships with both parchment (off-white) and black switch tips so you can use whichever is more visually-appealing. Check out the images above, showing the unit used in both Strat and Tele applications. On this particular Strat pickguard, had we installed the black switch cap it would have all but disappeared against the pickguard. The Strat assembly shown above utilizes the pushbutton in conjunction with our narrow superswitch. 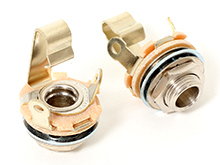 If you buy one of these pushbutton switch units for use in a wiring scheme that also requires a 4-pole superswitch, you'll need our narrow one, as the pushbutton switch won't fit with the normal (wide) superswitch that you find elsewhere.